Mars ain’t the kind of place to raise your kids, but apparently, like some post-apocalyptic nightmare scenario, cockroaches will thrive in that environment, a terraforming tool out of control that has adapted to the harsh conditions to evolve into new species Terra Formars. A plan which has lasted five hundred years, the hardy cockroaches were intended to spread moss across the surface of Mars, releasing trapped carbon dioxide and increasing the atmospheric density and temperature through the greenhouse effect. Instead the radiation and harsh environment has accelerated their mutation to bipedal monsters, the situation inherited by Professor Ko Honda (Shun Oguri borrowing Zorg’s haircut from The Fifth Element) which he intends to resolve by sending an expedition composed of reprieved criminals aboard the BUGS 2 to remove the infestation. Subjected to genetic manipulation themselves in order to be better equipped for the environment and to defeat the aggressive swarms of Terra Formars, their backgrounds vary; a terrorist, a Yakuza, a hacker, a kickboxer, an illegal immigrant, while for some such as Shokichi Komachi and Nanao Akita ((Hideaki Itô and Emi Takei) the only crime they committed was trying to survive in the cruel world of 2597. That future Earth bearing a suspicious resemblance to Blade Runner, rain washing down on the umbrella-wielding masses on the crowded neon-lit streets as cop cars fly overhead, perhaps that can be attributed to Japan reclaiming what belonged to them in the first place, and the action soon moves forward two years to a surprisingly green Mars. The landing site overgrown with moss, so are the skylines quite obviously inserted via greenscreen even before the mismatched crew meet their massed adversaries and engage their latent inserted DNA sequences, created equally through over-the-top prosthetics and a surfeit of post-production enhancements. 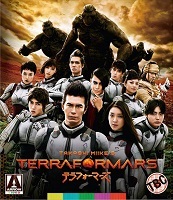 Based on the long-running Manga of the same name written by Yū Sasuga and Kenichi Tachibana and adapted for the screen by Kazuki Nakashima, the legendary Takashi Miike has directed over a hundred films so he can be excused if the bugs-fighting-bugs premise of Terra Formars (テラフォーマーズ) is a squished blot on his notable career. Each transformation more ludicrous than the previous in the game of arthropod attrition, the team take on the forms of hornets, locusts, weevils and stag beetles in order to defeat the cockroaches, Starship Troopers without the leavening element of satire or humanity. Disregarding every major branch of science even as it namechecks them, evolutionary theory, atmospheric chemistry, simple mechanics and gravity, the dialogue consists largely of men shouting emphatically at each other while maintaining stoic facial expressions. The accompanying “making of” featuring premiere footage and interviews with the ensemble who convey their sincere gratitude for their involvement in what they regard as a revolutionary project, sadly the result more is more akin to Power Rangers with copious swearing and decapitations.